I'm not entirely sure what the producer's saw in Colin Trevorrow's indie comedy SAFETY NOT GUARANTEED that made them think, "this director has what it takes to direct a big budget effects-heavy action film" but boy, he can! JURASSIC WORLD is the best film in the franchise since the original, and while not entirely without its problems, it's a handsome way to spend a couple of hours in the cinema. The movie picks up as if the events of the second and third film hadn't happened. We are twenty years on from the "teething problems" on Isla Nubar and arrogant money-hungry humans have learned nothing. Jurassic World is now a successful theme park, but in order to keep the customers happy, park manager Claire (Bryce Dallas Howard) has sanctioned the genetic modification of dinosaurs to create a new attraction - the Indominus Rex. Oh, and by the way, those insanely violent Velociraptors are still in the park because some idiot wants to use them for military purposes. Naturally, the Indominus escapes its enclosure and we soon learn that a) it's not socialised and b) it can plan complex strategic attacks. All of which the wrangler Owen (Chris Pratt) had warned them of. 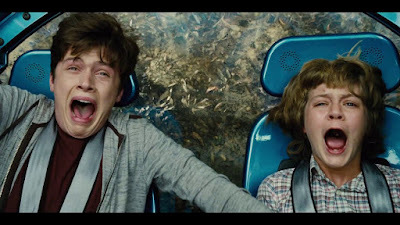 And this being a Spielberg film, into the mix we throw two kids - brothers Zach and Gray (Ty Simpkins and Nick Robinson) and a T-Rex. Everything about the dinosaurs, action, soundtrack and sense of awe and wonder is perfect in this film. It's less scary than the original, which I rewatched recently, but it's going for a younger audience. The problems start when we look at the characters and the relationship between Claire and Owen in particular. Dear Hollywood, does every successful businesswoman need to be emotionally frigid? Does every powerful really woman really just need a hunky old-fashioned man's man to sort her out? And it's not like Chris Pratt has it any better as Owen - shorn of the humour that made GUARDIANS OF THE GALAXY such a hit, he's essentially just an objectified beef-cake. And where the two kids in the original movie had a really lovely mixture of vulnerability and moxie, here they're essentially just Macguffins for the adults to protect. Still, for all that, I do like this film. It has all the cynicism about human nature that infected Michael Crichton's book. And where that dark element was only channelled by Jeff Goldblum in the original film (I HATED the transformation of the park owner into a cuddly wide-eyed grandpa) at least in this version Irrfhan Khan has the evil charisma of a true DNA-meddling entrepreneur. JURASSIC WORLD has a running time of 124 minutes and is rated PG-13. The movie went on global release the weekend of June 11th and finally rolls into Japan on August 5th.